Sundarwadi is a small hamlet located in the drought prone Paithan block of district Aurangabad. 1. Sundarwadi is a small hamlet located in the drought prone Paithan block of district Aurangabad. The village is at a distant of 50 km from Aurangabad (divisional headquarters) and 25 km from the block head quarters. It is situated in the interior and though approachable by partially tarred road, it has nevertheless been largely neglected by governmental and other developmental agencies. The prime occupation of the community is farming which is rainfed and traditional. 2. 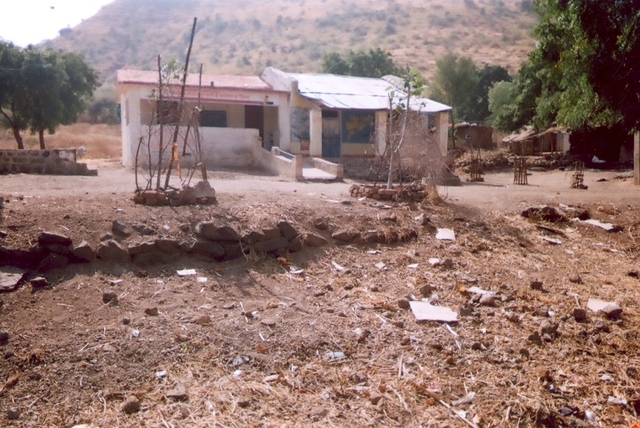 Sunderwadi is a tribal community. Poverty, access to information, sanitation, awareness about development and illiteracy are its key problems. To overcome this situation, the villagers decided to implement watershed development program in their village and approached WOTR for the implementation of the same in 2005. 3. Since the last two years, the WOTR Wasundhara project is being implemented in the village, in collaboration with the Gram Panchayats. The soil and water conservation measures, self help groups, drinking water scheme (deepening of old well, pipeline, water tank, stand post etc.) and other activities have been initiated. 4. The school sanitation project will be implemented for the primary school of village Sundarwadi. 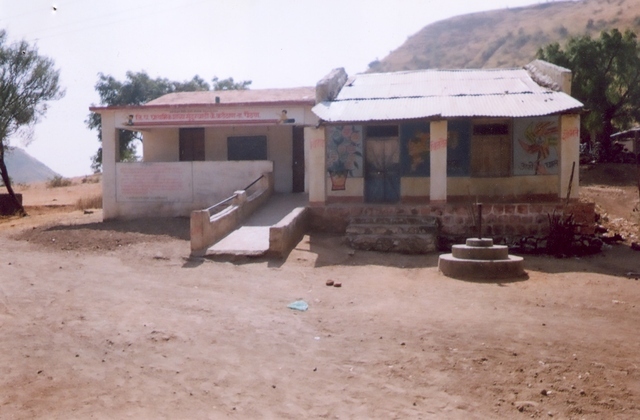 The primary school is up to 4th standard and has two classrooms only. Presently there are 27 students (boys 15, girls 12). Awareness regarding sanitation is practically non-existent. 5. The objective of the project is to create awareness among the community through school children and it is expected that the total village could come under eco-sanitation in due course. There is also a felt need to construct 2 additional classrooms as the present 2 have to accommodate students across 4 grades/ classes. 6. The proposed activities for the school are: construction of a new water tank, sanitation unit, one vermi-compost pit, plantation of 400 saplings, 2 classrooms and water management and sanitation education to school children and parents. The implementation of this activity will help to change the school environment and in turn will help to increase school attendance as well as eventually secure total sanitation in the entire village. The women members of the Self-Help Group (SHG) have been motivated for the use of toliets. Presently six members of the SHGs have constucted individuals toliets with their own cost. 1. A new water tank having capacity of 2,500 litres will be constructed for the school. 2. Sanitation unit – 2 toilets with urinals (1 for boys and 1 for girls) will be constructed. 1. As a watershed development project is in progress since the past 2 years, social mobilization, women self help groups and local village level institutions have been established and are being strengthened. The entire village is contributing at least 20% of the total cost of this project. 2. In regard to this school project, a school sanitation committee will be formed with representatives from the village (men, women and teachers). With the support from the villagers and children, this committee will be responsible for implementation, supervision and maintenance of the project. 3. In addition to what the people are already contributing (see 1 above), they have agreed to contribute at least 15% of the total costs of the school water and sanitation project. • A vermi-compost unit with shade in the school campus will be constructed. • Tree plantation along the boundary of the school premises (approx. 400 saplings). Implementing Organization: Implementation unit of WOTR-Sanjeevani. This project will be implemented by Sanjeevani, a sister concern of WOTR. Sanjeevani focuses on the implementation of development projects in rural and urban areas in Maharashtra and other states of India, with a preference for the tribal and marginalized communities living in degraded environments. The four main thematic areas addressed are (a) community and institutional development (b) poverty reduction (c) natural resource management and (d) livelihood development. Sanjeevani has its cluster offices at 9 locations in western and north Maharashtra, in Marathwada and Vidarbha. It is headquartered at Aurangabad. Sanjeevani has qualified and experienced technical and social personnel nearly all of whom have come form WOTR. The entire project is very worthy, but BPR scope is on the drinking water and sanitation component. The details of the water tank in the budget seem to contain some error: should there be 6 tanks? Is it just ground water that is pumped up to the tank? I assume that the other watershed development that has already taken place will be recharging the ground water. Is the school roof water being guided towards recharge or capture? Thanks rajesh for your feedback. Rs. 6 per liter (not 6 tanks) which works out to Rs. USD 375. 2. The ground water will supplied to the school water tank. The newly constructed water tank of 25,000 ltrs capacity is situated at the height of 15 meters from the ground level, therefore the drinking water would flow to the school with gravity. 3. The school roof water is not guided towards recharge or capture. Since the watershed activities has been carried out in this village it would support the present completed drinking water source i.e well. Though the drinking water project has been initiated in the village through women, a separate drinking water connection would be provided to primary school for drinking water, toilet and sanitation purpose. As I understand that the number of heads that will receive water and sanitation will be primarily at the school is 27. What about the number of teaching and non-teaching staff? What is the source of water of the children at home? Or am I misunderstanding the number. Good project for the upliftment of the tribal people who have more community feeling than the others. The Sunderwadi is a small hamlet of the main village named Parundi, which is about at the distance of 5 km. in interior (in the middle of the hill range) from the main village. The hemlet having a primary school upto 4th std. and the number of teachers is 2. At present the number of primary school children (upto 4th std) is 27 only. The students from 5th std. onwards (upto 10std.) go to the main village (Parundi) for school. Recently WOTR has completed the drinking water project (deepning of well, underground pipeline, pumpset, construction of storage tank and construction of stand post, etc.) in the village with its own funds alongwith the watershed activities. Now the drinking water problem has been solved. The extension of drinking water connection and school sanitation activities are planned under the BPR project. but only 6 getting sanitation? 319 other people - who are they and how do they access the water? Are they the children expected in new class. We can pursue alternative funders for the classrooms, until that happens what is the number of folks/children for both water and sanitation? 1. 27 children getting water – This is related to the proposed drinking water and sanitation project. These children will get water through the drinking water project as well as toilet facilities in the school premises, once it is initiated. Adjacent to the school there is a Balwadi (kinder garden) involving 15 children. The balwadi children would also use this drinking water and toilet facilities. Therefore, 42 children will get benefit of this project. 2. but only 6 getting sanitation? - As a result of the drinking water project initiated by WOTR (with its own fund) in the village, people are motivated and have decided to free their village from open defecation (use of 100% toilets). As a part of this, all the families (50) in the village have purchased toilet pots. Out of these 50 families, 6 families have newly constructed toilets with their own costs. The remaining families are in a process of construction of individual toilets with their own cost. 3. 319 other people - who are they and how do they access the water? - The 319 people (50 families) are the inhabitants in the village. Through the drinking water project initiated by WOTR (mentioned above) they have now access to water from this project. 4. Are they the children expected in new class. The total average no of students in the primary school is 27. The students who will pass out the IV class would be replaced by the balwadi children. Hence on an average there would be approx. 40-45 students. And all these would access sanitation. 5. The number of children for both water and sanitation would be approx. 40-45 and villagers (folk) would be 50 families. Good project but more cost is put in the construction of the 2 classrooms hence for water and sanitation the cost per student is too high. School sanitation is an important aspect and has linkage to enrollment and attendance of children. However it is also important that simultaneously community is made aware of the importance of sanitation and take up sanitation on a cent percent basis. A very good small project to piggyback a big watershed development project on. However, BPRF can only consider funding the water and sanitation part.